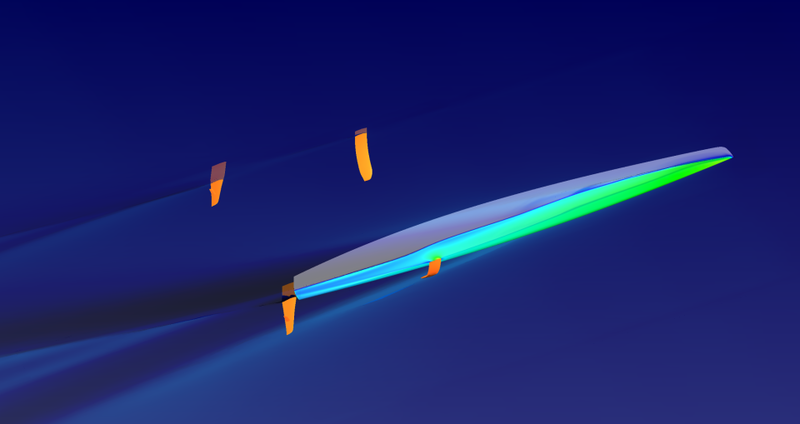 The new D3 is being developed with the latest CFD technology used in the Americas Cup, it features S boards and production rudder winglet. Along the Paradox and new DNA J boards testing these builders are pushing development started by Martin Fischer's Mayfly, that didn´t had a good debut at Aarhus Worlds and the concept wasn´t further developed in that specific boat. This season the Paradox will give Fischer's concept a new try, while Gonzalo Redondo and Dominik Scheurer are launching a similar concept trying to generate additional lift. Of course all have to be proven in the hardest field, that is actual racing. Below an excerpt of Gonzalo Redondo´s interview I made, on the A-Class and the D3. MV: Now with Dominik Scheurer you are launching the new D3 A-cat, do you sail yourself? Gonzalo Redondo: I'm just another midfleeter in the class. I always loved sailing but never... had the chance or opportunities to always compete, I sailed in Optmist as everybody, then Snipe for a couple of years and I finally sold it to sail a Dart 18, mostly for fun. When I get back to Galicia we do cruising on a very nice 53 footer. Regarding A-Cats, it was great during the AC campaign sailing together with Adam May and the very strong A-Class fleet in Valencia, we had 17 boats! Adam had a lot of patience waiting for me every while until I was able to catch up and be competitive upwind, downwind I got better but still struggle. In any case, I keep in mind I'm not a sailor and that I sail to enjoy and understand the boat. I already said I bought an A Class at the beginning of the campaign (Scheurer G4). 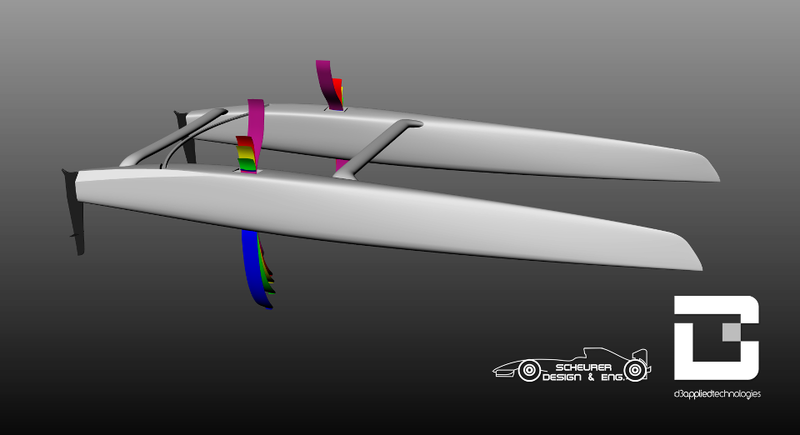 Right now I have an Australian Flyer 2 Geltek which I modified with DNA boards, fat transom and a latest generation rig. Philip Griffiths did a great job with the refit, he's well known in Europe for his talented hands when it comes to carbon-work. Adam was doing the same with his Flyer 2, now called Flyer 2A. I guess by telling all this I'm argumenting the fact that I have a moderate CFD approach. Nicolas Rousselon, the aero guy in Artemis Racing, also had a modified flyer 2 with Scheurer curved boards and wide transom. Right now I'm sailing at the Real Club Náutico de Vigo, in Galicia. Same spot where the Nigrán F18 Worlds took place. We are only 3 boats but people are starting to get interested. GR: We will have S foils and rudders with winglets. Upwind, the board is similar to C boards with a moderate blend towards a J. I think we can be as competitive upwind as the current generation boards and take advantage of the board geometry to maintain vertical force downwind and get rid of useless sideforce. With the winglets on the rudders we are able to control that extra lift. We have tested 15 boards in different conditions and this week we are doing the hull research with the final board. I believe a hull has to be designed for the boards and not viceversa. MV: How do you foresee the future of the class and beachcat racing in gral, Flying is the ultimate goal in the future? GR: Right now, I don't think so, tomorrow, who knows.... We might end up flying downwind but as of today I think the class is good as it is and I believe a big step in development would not do any favour to the class. The rule is working great so far and if we see it needs a change in the future I think it should be done progressively so that old boats are still competitive for 3 or 4 years.